Browse our collection of 1 Independence Day T-Shirts and more. Designed and printed in the USA. 100% Satisfaction Guaranteed. About this Design I'm a patriot. I'm not a patriot for just 4th of July though. 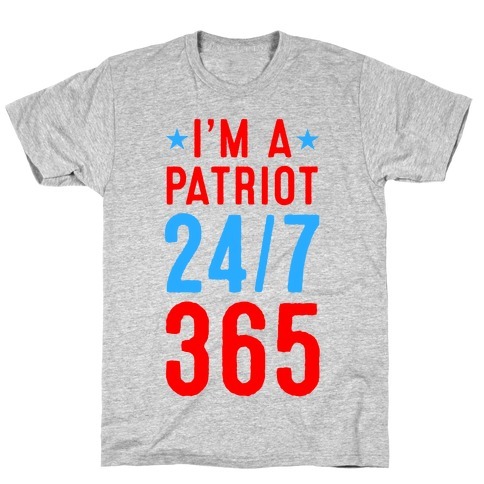 I am Patriot 24/7 365. I love merica all year around like anyone should. Your love of country should not just happen one day of year. USA should be loved forever and always, every hour of every day of every week of every year. So screech your love of freedom every day with this awesome american design. I'm a patriot. I'm not a patriot for just 4th of July though. I am Patriot 24/7 365. I love merica all year around like anyone should. Your love of country should not just happen one day of year. USA should be loved forever and always, every hour of every day of every week of every year. So screech your love of freedom every day with this awesome american design.